Rasheeda had asked for the steps , so they are posted on this page today. 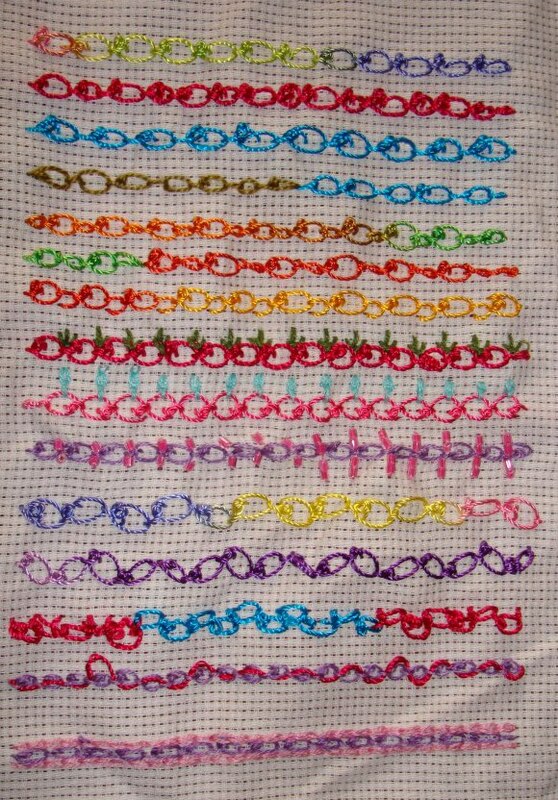 TAST 2012 8.Chain stitch-8 samplers. 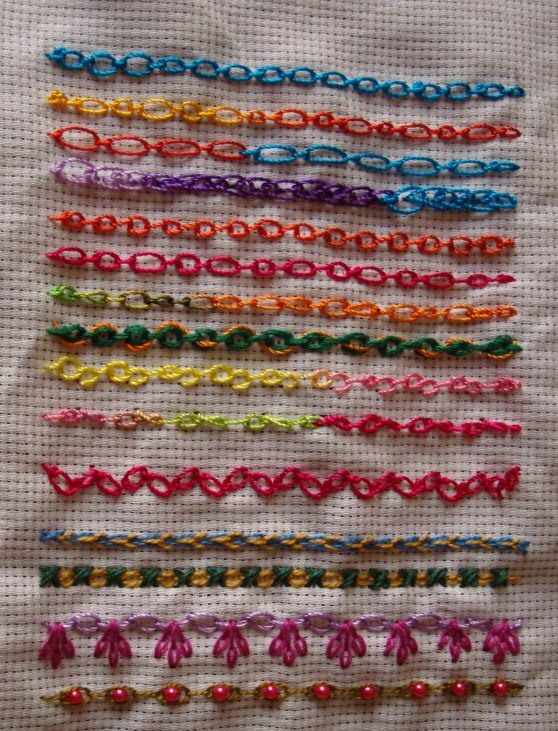 The pictures of the four chain stitch varieties , which I had worked this week. 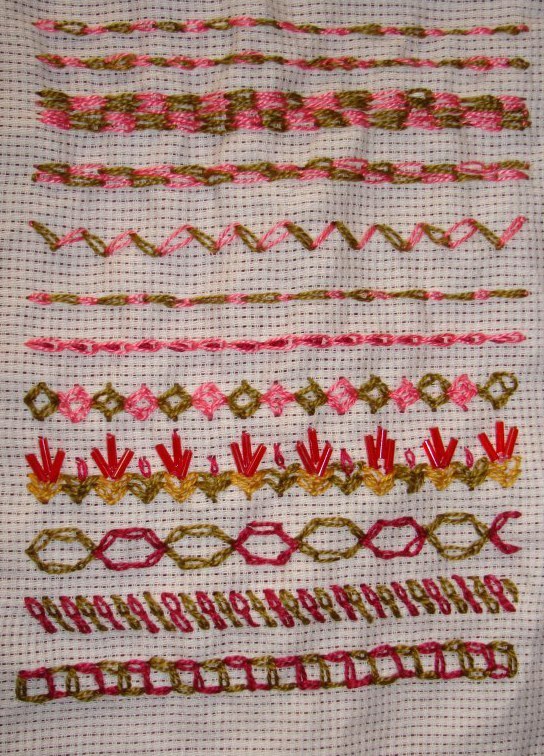 As a part of the chain stitch [TAST 2012 stitch challenge] varieties, I am working on samples of checkered chain stitch. 1- These rows are for getting the feel of this stitch. 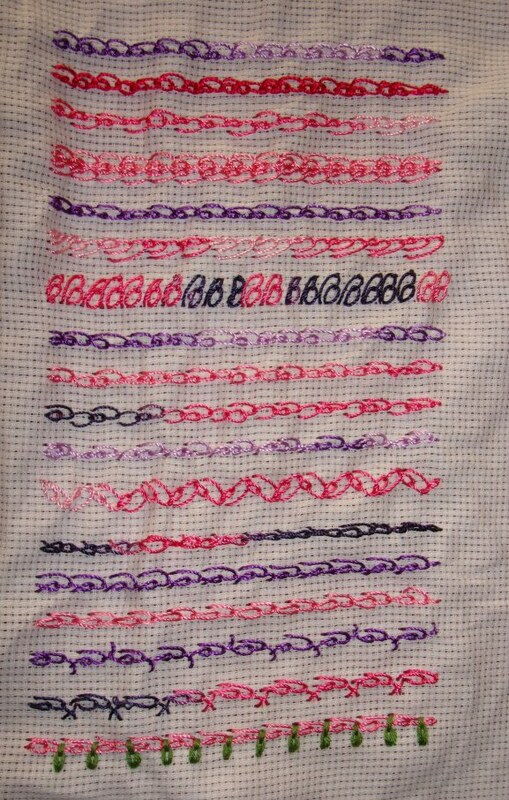 2-did a zig zag version of checkered chain stitch. 3-a-the length of the chain stitches are varied. 4- worked this row, keeping the checkered chain stitch idea. 5-the same checkered chain stitch idea is worked in another variation, with bugle beads. 6- another variation, where a pattern is formed with this stitch. 7-two chain stitches in alternating colours are worked in this row. 8- another pattern is worked in this variation. With this row I completing my checkered chain stitch sampler. Tomorrow I need to start on shell chain stitch , which is the last variety of chain stitch , I am working this week . Today I worked some more samples of knotted cable chain stitch. 4-after working a row of this stitch, I added pink seed beads over the knot. Tried adding two beads to see the effect. a-the knots were done in an angle and the chains were worked in straight line. b-the knots here were worked on straight line and the chains were worked in an angle. c- in this row the knots and the chains are perpendicular to each other. The working of the row is not good. 6- a row of knotted cable chain stitch is laced with another thread. 7-two rows of chain stitches are worked with knotted cable chain stitch. With these samples I am completing my knotted cable chain stitch sampler. Tomorrow , starting with checkered chain stitch. The next stitch in the varieties of chain stitch, is knotted cable chain stitch. This was the 48th week’s stitch of the TAST Challenge by SharonB. I had never tried this stitch before, my samples in this picture are mainly to get the feel of the stitch. I have tried varying the length of the knot and the chain in these rows. These three rows, I have combined this stitch with normal chain, twisted chain and open chain stitches. 3-in the first row I worked fly stitches along with this stitch. In the next row detached chain stitches are worked with this stitch. I’ll try to work on this stitch some more tomorrow.